Can you do all of the mobs next? Yes, the zombie and pigman will be easy, I have almost finished the creeper and the pig. I have an update video on progress! Shows some fixes with the downloads I posted on my video, also some projects that you all might like. I am having something go wrong when I open the .mb file, I am a little bit of a noob at this but when I open it, in 2011 its completely white and in 2012 its completely black, any reason? As I can see, everyone's lights are very bright. Does anyone know, how to fix this? If this is when you are rendering, I will be posting a video in a days time as to correcting this. It is actually very simple but I think it is easier if people see it done then trying to explain it over just words. There is no problem at all, the black and white colors DO NOT matter. Dont even pay attention to that. It is just because it's looking for shrogg's char.png file. I have posted a video a while back on how to deal with this and also adding your own minecraft skin. It is on my youtube channel so go check that out if you feel compeled to or need to. "Errors have occurred while reading this scene that may result in data loss. Please check Script Editor for details"
// File read in 0 seconds. // Error: Error reading file. //"
If I am not mistaken this version of the rig was created in 2011, meaning that you would have to update your maya. If you also wanted a newer and more updtaed version of the rig, go to my youtube channel and find the maya video called two rigs in one scene, and i give a download link. Though you would have to use autodesk maya 2013. I'll try both... thanks for the help! 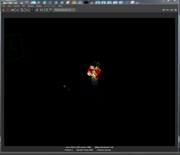 When I try to render the current frame I get a error saying "//Error: setParent:Object 'renderView" not found." Is there anyway to fix this? ok. I was going to say post some screenshots of the situation, but nvm. I figured out a different way through maya. I just used hypershade and put my skin in. Thanks for trying to help anyways! I don't know. I would think it would though. 1 question: I can make him move legs and arms, but how do i meake him bend them like in video? Please be more specific. Like in an animation? What you need to do is set the rig to be in an edit mode. I am blanking on how to do this. But i do remember that there should be a check box in attribute editor or channel box and you need to click through one of the boxes until the rig becomes editable. I am sorry i couldn't be more specific but i hope this helps. The only way I think it could become compatible was if from maya you saved it as a .obj file? I am not 100% positive about that but i think it could work. Hi. I need help. I'm trying to render my model, but I keep getting those annoying control lines in the render. The lines that you manipulate the character with. Can someone reply to this explaining how to hide those? I would be most grateful. Yes. What you need to do is go to the show window, this is not in any of the bars, it is in the actual area/panel. Then click none, and everything will disappear. Then just check the box that says polygons, and it will only render your character. Hope this information helps. Thanks for your response. However, your solution did not work. Attached are screenshots of what my current Maya workspace looks like, including the show bar and my render when I try to export. Mental ray works without the lines, but I'd prefer to use Maya Hardware 2.0, seeing that it's more high-quality, in my opinion. Maya Hardware 2.0 is what the image was rendered with.